Why not celebrate your big day with a pottery painting party? Each guest can choose a pottery piece for our beautiful range to paint and decorate it however they like, the possibilities are endless! 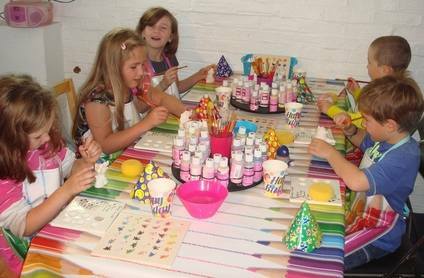 When you book a birthday party with us you will have the whole studio to yourselves for up to 2 hours. This allows time for the guests to choose & paint their pieces, and any remaining time can be used to eat a party tea! We do not supply the party food but you are more than welcome to bring some along with you. We can seat up to 12 children for a party & have a minimum requirement of 8. Parties are run between 10:30am & 12:30pm or 2pm-4pm at weekends (Am parties only in Nov & Dec). Please note that we are unable to do childrens parties on weekdays in the school holidays. A £30 deposit will be required at the time off booking a party which will be deducted from your final bill on the day. The deposit is refundable if you change your mind provided you give us 7 days notice of cancellation before the party, otherwise the deposit is forfit. The party price range is up to you! You set the children a price limit of what they can spend per head and they can choose to paint anything within the budget! For example our paint-able animal models (shown in the photo below) are always a hit with the kids are priced at £9 each. There are no additional charges, you just pay for what the kids paint. Once painted your items will be available to collect from us in 7-10 days.